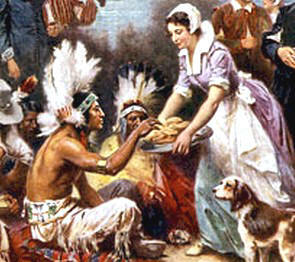 The Pilgrims first arrived in America in sixteen twenty. They were separatists from the Church of England and other settlers. The ship that brought the first group was the Mayflower. An exploring party landed at Plymouth, in what became the Commonwealth of Massachusetts. The state is named after an American Indian tribe – a recognition of the groups that came long before the Pilgrims. The first Pilgrims established a village. Those who survived the first difficult years held harvest festivals and religious celebrations of thanksgiving. These events formed the basis of the holiday that Americans now celebrate. But there are no official rules for a Thanksgiving meal. Some people like to find ways to do things a little differently. Pilgrims: Peregrinos; separatists: separatistas; settlers: colonizadores; brought: trajo, transportó; exploring party: grupo de exploración; became: se transformó en; Commonwealth: Comunidad; is named after: lleva el nombre de; recognition: tributo, reconocimiento; held harvest festivals: realizaban festivales de cosecha; rules: normas, reglas; meal: comida. 1) When did the first Pilgrims arrived to the US? 2) What was the "Mayflower"? 3) Who were the "Massachusetts"? 4) What did the first Pilgrims hold? 5) Which are the official rules for a Thanksgiving meal? Pulsa aquí para consultar una sencilla receta a base de pavo que se aparta de los recetarios tradicionales para esta festividad.